Our control room is twelve by eighteen feet features a floating floor and large window for viewing artists in the recording area. 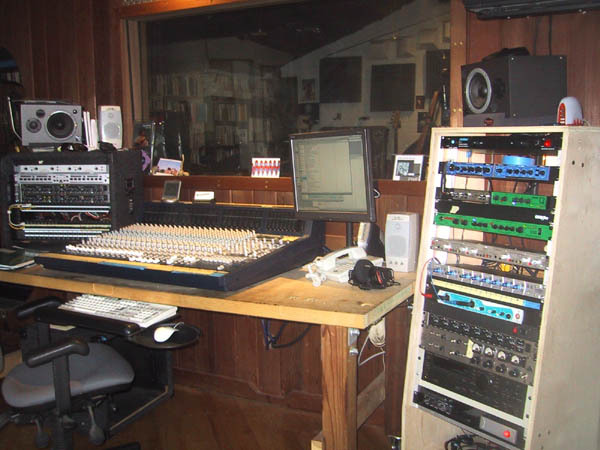 It is the center of our professional sound stage and Pro Tools post production facility. Combining the Power of Pro Tools with ith a 48-channel mixer and numerous prea-amps, compressors we feature 18 tracks of 24-bit digital recording, and unlimited tracks for editing, mixing and mastering. Custom headphone mixes for multiple performers in group settings. The Racks were moved from the closet to beneath the table. New veneer was placed on the table. Monitoring at 60 degrees @ ear level. Mac and PC's are ten feet away in the closet. Both are accessible with KVM swith. Flat Panel monitor with arm is easily re-positioned, while the keyboard and mouse tuck under the desk. 32 Channels pass through several snakes to the recording room. 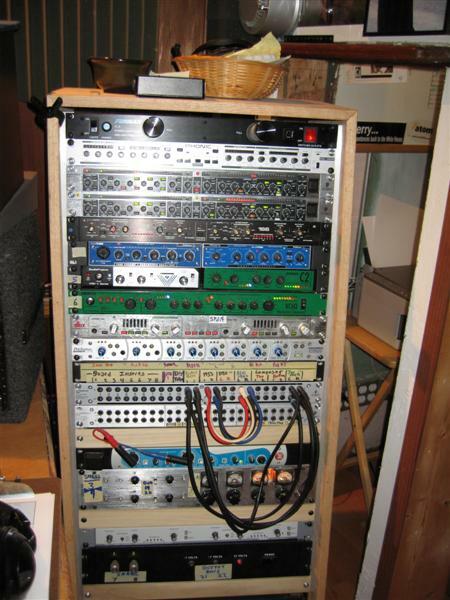 Meticulous wiring and patch bays enable quick configurations and access to numerous pre-amps, compressors and eq. The monitors are now wall mounted at 60 degree optimal listening placement. Subwoofer has been implemented beneath Desk.